The so-called University in Exile was an important node for émigré academics during the 1930s and 40s. Established as a graduate school for the New School, it sponsored 183 academic émigrés and became a center of European intellectual life in the United States at the time. Created in 1933, it served as a refuge for European intellectuals facing persecution by the Nazi regime. It was the brainchild of Alvin Johnson, the co-founder of the New School for Social Research in New York, and made possible the immigration of many European scholars who would go on to enrich the American academic landscape and deepen connections between Europe and the United States in numerous disciplines. Following Hitler’s ascent to power in 1933, many prominent Jewish and left-leaning academics were dismissed from their university positions. By some calculations, over 39% of all university teachers in Germany lost their positions, with this figure considerably higher among economists and social scientists (Krohn 1993, 12). Organizations including the Emergency Committee in Aid of Displaced Foreign Scholars in the United States, the Academic Assistance Council in Great Britain, and the Notgemeinschaft deutscher Wissenschaftler im Ausland in Switzerland were founded to help scholars affected by this purge find academic positions at foreign universities. Though the United States was not the only or, in the early stages, the most common destination for displaced scholars—many took positions in Great Britain, Turkey or Palestine— an increasing number crossed the Atlantic as the political climate worsened in Europe and with the outbreak of the war. One of the most highly concentrated groups of émigré scholars in the United States was at the newly-founded University in Exile. Efforts to bring European scholars to the New School were spearheaded by its director, Alvin Johnson. The son of a Danish immigrant, Johnson was familiar with the academic landscape in Europe and in contact with some of its most prominent figures through his work in the 1920s on the Encyclopedia of the Social Sciences, a multi-volume collection that he coedited with his former teacher, Columbia economist Edwin R.A. Seligman. Among the many German authors to contribute articles to the Encyclopedia were economist Emil Lederer and sociologist Hans Speier—two individuals who would later collaborate with Johnson to bring European scholars to the United States. Having observed the 1933 purge of German universities, Johnson seized the opportunity to strengthen the New School, a small progressive institution founded in 1919, as well as to protest both the injustice of the Nazi regime’s actions and the slowness of the American government and universities to respond. He proposed the establishment of the University in Exile as a graduate program with a focus on the social sciences. Its creation would serve the dual purposes of introducing American students to some of Europe’s preeminent social scientists and of providing those scholars an academic home in the United States. Johnson’s plan explicitly aimed at a transatlantic transfer of people and ideas. By the time he began contacting European scholars and extending offers in June 1933, some had already accepted invitations to teach in Britain or elsewhere. 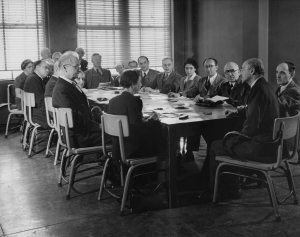 Nonetheless, with Lederer managing hiring from his temporary home in London and Speier delivering invitations personally within Germany, the New School was able to assemble a faculty in time for the fall 1933 semester. Johnson, who was committed to a broadly defined New Deal agenda, had sought out scholars whose work, he hoped, would provide new and realistic strategies for dealing with the problems facing depression-era America. As a result, the original group of twelve scholars—eleven German and one Italian—included six economists: Karl Brandt, Gerhard Colm, Arthur Feiler, Eduard Heimann, Frieda Wunderlich, and Emil Lederer who would become the program’s dean. The remaining faculty members came from related disciplines: Hermann Kantorowicz (law); Hans Speier, Albert Salomon, and Erich von Hornbostel (sociology); Max Wertheimer (psychology); and the sole Italian, Max Ascoli (political science) who joined the program in the winter of 1933. Upon opening, the University in Exile was renamed the Graduate Faculty of Political and Social Science and, though it began with only 92 students in the fall semester of 1933, by 1940 this number had risen to 520 and the Graduate Faculty had gained the right to award master’s and doctoral degrees. From the beginning, the University in Exile was on uncertain financial footing and dependent on donations and grants for its continued existence and growth. Johnson initially struggled to collect the $120,000 needed to begin the project, asking around within academic circles for donations. It was only after the New York Times ran an article about the proposed University in Exile that Hiram Halle, a businessman in the oil industry, offered to provide the necessary funding. Following the establishment of the Graduate Faculty, Johnson was able to secure grants from the Rockefeller Foundation, the Emergency Committee and other organizations to pay salaries, create additional teaching positions and fund projects. Though the size and frequency of these grants varied and financial worries persisted, the program continued to grow. Among the émigré scholars added to the faculty roster were the German political scientists Arnold Brecht and Hans Simons; economic psychologist George Katona, Alfred Kähler and later Adolph Lowe who, like first-generation Graduate Faculty members Gerhard Colm, belonged to the Kiel School of economics; Italian historian Gaetano Salvemini; Hans Staudinger, a German Social Democrat, economist and second dean of the Graduate Faculty; and Erich Hula, an Austrian political scientist and former assistant of legal scholar Hans Kelsen. The outbreak of World War II not only meant the arrival of a new and more intellectually diverse wave of displaced scholars from across Europe, it also signaled a shift in the Graduate Faculty’s place within American politics. While historians have at times dismissed the New School as a closed-off European ivory tower, or a “gilded ghetto” (Coser 1984), recent scholarship has emphasized the impact of the émigrés on contemporary American thought. Franklin D. Roosevelt’s New Deal was influenced by the Kiel School of economic thought on structural growth economics, which combined traditional progressive era ideas and Keynesian economics to leave a significant mark on American economic policy. With the United States’ entry into the war, many of the Graduate Faculty’s European scholars—including Arnold Brecht, Hans Speier, and Gerhard Colm—were also called on as consultants by the U.S. government. The Office of Strategic Services in particular recognized the émigré intellectuals at the New School as experts on the political and social conditions in Europe, and benefited greatly from the research done by scholars like Gaetano Salvemini on the rise of fascism in Germany and Italy. In the postwar years, the Graduate Faculty gradually became less distinctly European and was eventually integrated more closely into the rest of the New School. The university as a whole focused less on exerting influence on U.S. public policy and turned its attention more strongly to teaching. It did, however, continue to employ prominent émigré intellectuals, including the political theorist Hannah Arendt, who taught at there from 1967 until her death 1975. Others, like Thomas Mann and Paul Tillich taught guest lectures or were involved in seminars at the New School. While many émigré scholars stayed in the United States following the end of World War II, some returned to Europe to visit, if not to stay. Many refused to return to their old institutions because of the schools’ failure to remove former Nazis from teaching positions or because the émigrés now considered the United States, not Germany or Europe, home. Nonetheless, the visits made by University-in-Exile scholars to Europe allowed for a cross-fertilization of European and American ideas and ongoing transatlantic intellectual exchange. Coser, Lewis. Refugee Scholars in America: Their Impact and their Experience. New Haven: Yale University Press, 1984. Heilbut, Anthony. "The Intellectuals' Migration: The Emigré's Conquest of American Academia." Change 16, no. 5 (1984): pp. 24-25, 32-36. Krohn, Claus-Dieter. Intellectuals in Exile: Refugee Scholars and the New School for Social Research. Amherst: University of Massachusetts, 1993. Lyman, Stanford M. "A Haven for Homeless Intellects: The New School and Its Exile Faculties." International Journal of Politics, Culture, and Society 7, no. 3 (Spring 1994): pp. 493-512. Rutkoff, Peter M., and William B. Scott. New School: A History of the New School for Social Research. New York: The Free Press, 1986..
Scherer, F. M. "The Emigration of German-Speaking Economists after 1933." Journal of Economic Literature 38, no. 3 (Sept. 2000): pp. 614-626. Arnold Brecht Papers, 1865-1974 (GER-024), M. E. Grenander Department of Special Collections & Archives, University Libraries, University at Albany, State University of New York, Albany, New York. Hans Simons Papers, 1906-1968 (GER-082), M. E. Grenander Department of Special Collections & Archives, University Libraries, University at Albany, State University of New York, Albany, New York. Hans Staudinger Papers, 1928-1979 (GER-087), M. E. Grenander Department of Special Collections & Archives, University Libraries, University at Albany, State University of New York, Albany, New York.